Not everything turns out well the first time around. And sometimes, when you’re taking up a new project that has the tendency to be finicky, a little research is required. In my case, it was angel food cake. Lumpy angel food cake. Several deadly sins led to the cake’s literal downfall. Eight egg whites have been sitting in my freezer for the past two months, since I made the decadent Chocolate Truffle Tartlets and didn’t want to throw out all the whites. I poured the whites into an ice cube tray (8 egg whites = about 12 cubes), froze them, and then switched them all to a dated freezer bag. And they were waiting. And waiting. Usually, angel food cake is divinely fluffy and light and healthy and ready to be topped with lots of juicy strawberries. Mine didn’t turn out like that though. 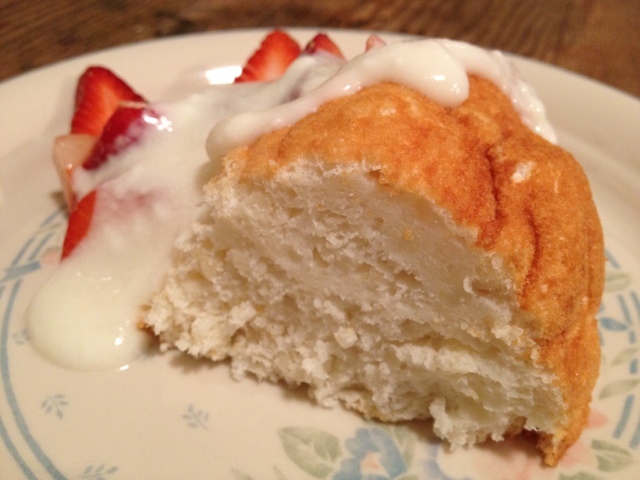 The goal was this Angel Food Cake with Lemon Honey Yogurt Sauce from Giada. I watched the episode during a lunch break, and was hooked. Everything she makes is amazing. I wish she were my best friend. 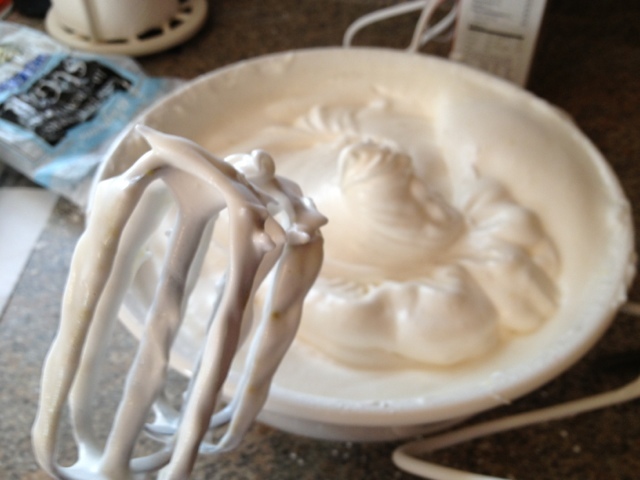 I got it all ready — lemon juice and lemon zest mixed with a dozen lightly beaten egg whites. The First Deadly Mistake: I didn’t sift. Sifting both the powdered sugar and the cake flour would have broken up all the lumps, and made the heavy ingredients nice and airy, just like the egg whites already are. Instead, first I just slowly added the powdered sugar. These egg whites are right, at least! The egg white mixture did turn into nice stiff peaks, like the recipe said. Look how full the pan was. And then look how small the cake got. 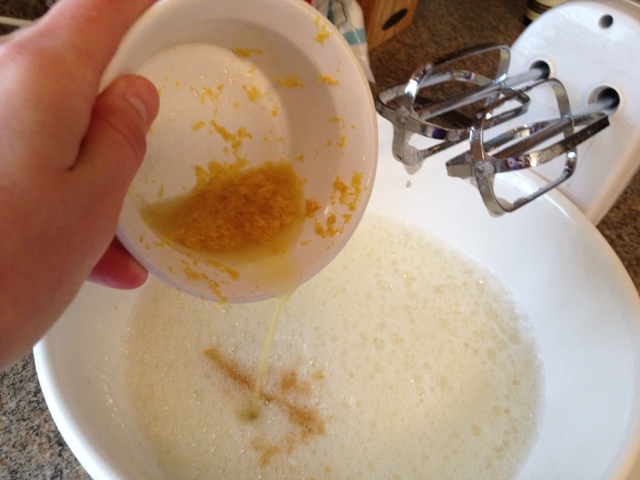 The Second Deadly Mistake: I didn’t sift. Okay, I said that already, but this time it was for the flour. 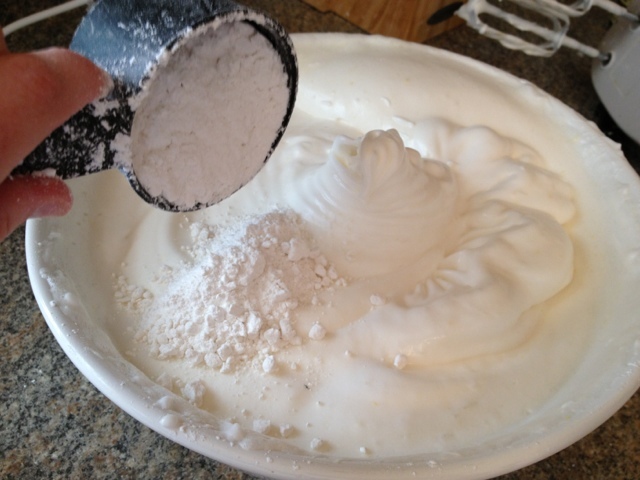 You want to slowly sift some of the flour in and then gently fold it into the egg whites with a spatula. The egg whites should keep all their air — you don’t want them to deflate. The Third Deadly Mistake: The pan. Post-cake research showed how the pan keeps your cake angelic. First, you don’t want to spray the pan. Why? Because the cake is supposed to “climb” up the sides of the pan, and then hold on tight to the metal. That keeps it from deflating. The Fourth Deadly Mistake: This is also about the pan. I thought that a Bundt pan would work just fine as a replacement. And maybe if you don’t combine all these mistakes then maybe it would. But for me, the pan contributed to the cake’s downfall. Here is a blog post from Epicurious about why the right pan is important. The Fifth Deadly Mistake: Cooling. I quickly removed the cake from the pan and placed it on my cooling rack. The original directions didn’t specify otherwise. 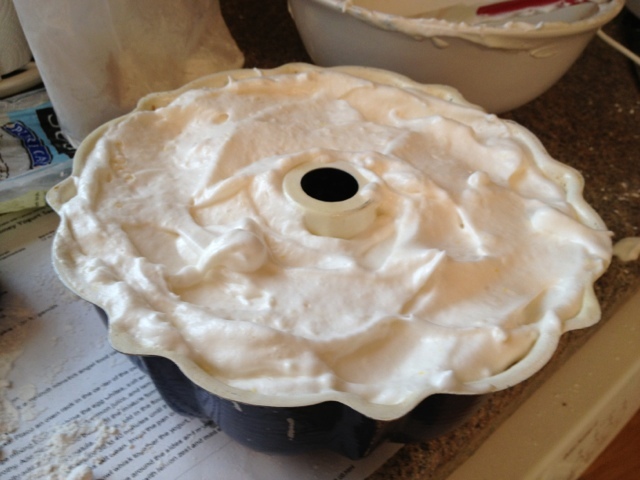 But what you want to do is invert the cake — because the sides stuck to the pan, the cake shouldn’t fall out. 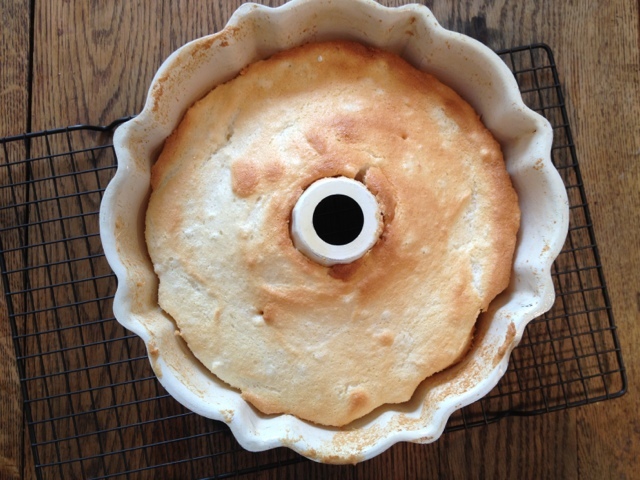 Some pans have little feet that will let air circulate underneath; if not, then you place the cake pan’s hole on a bottle or funnel.This blog post for a Strawberry-Glazed Angel Food Cake came up in my research. 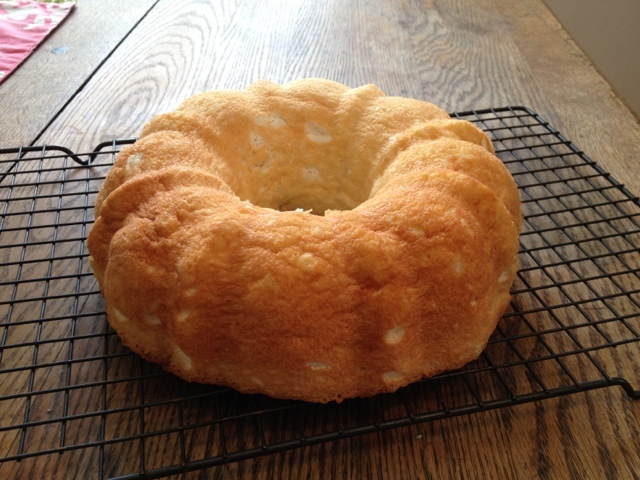 The author does a great job explaining how to achieve an airy and beautiful cake. It doesn’t look too, too bad, but it noticeable shrank while I was at the grocery store for an hour. And then cutting into it showed how there were hard lumps of flour or sugar. I still ate some, topped with strawberries and a lemon yogurt honey mixture. But, I’m going to try again next week. My mom has an angel food cake that I’m going to borrow. And I won’t grease it. I’ll let it cool properly. And I’ll make sure to add the dry ingredients gently. I think I’ll follow the Cook’s Illustrated recipe, too. Fingers crossed that Angel Food Cake, Take 2 turns out successfully. 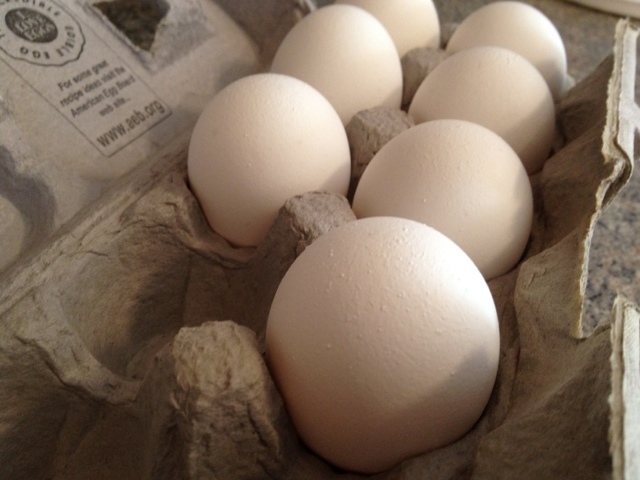 If not, at least I’ll have a dozen egg yolks to save for something rich and delicious and heavenly. Good luck! 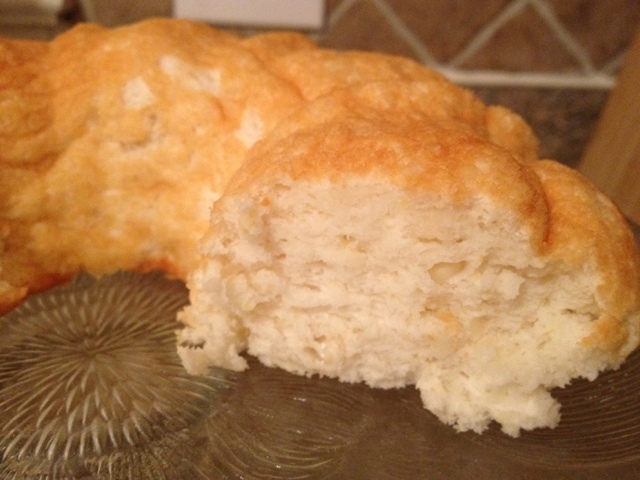 Angel food cakes are totally worth all the finicky-ness. Great post. I see a Food page story here—once you get it perfected. LMo. Oh you’re right! I will tell Elizabeth about it!